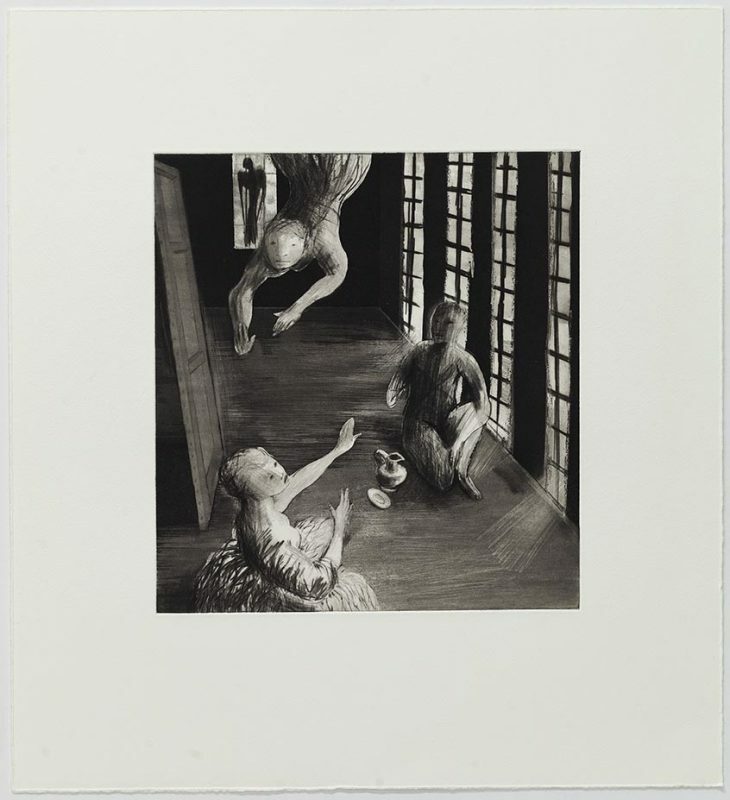 We are pleased to announce a new series of three complex etchings by Deborah Bell, which has been created in collaboration with American Master Printer Phil Sanders at the David Krut Workshop at Arts on Main in Johannesburg. We are offering three new editions at a special pre-publication price, valid until 30 June 2017. These images are a continuation of Bell’s previous printmaking series with Phil Sanders, completed in 2014. 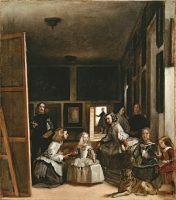 The Reveal Series now has two additional renderings based on Diego Velasquez’s Las Meninas (1656). “My Reveal series of dry point etchings continue to expand on the themes that evolved through a series of paintings I did between 2012 and 2014. 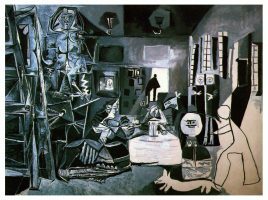 In these, I was using Velasquez’s Las Meninas (1656 – 57) as a source to explore imagination, creativity and the studio space as an alchemical workshop. I was interested in the dark studio space as a symbol of the brain, and the artist’s canvas represented either blank – the tabula rasa awaiting inspiration; or turned around showing its back – representing hidden knowledge. The angel in the doorway derived from a quickly made sketch in my notebook from Picasso’s painting Las Meninas (1957) also based on the Velasquez work. In my drawing, the cloak of the man in the doorway suggested wings, and this led me to think further on the idea of the brain, the third eye, and the source of inspiration. The figure that swoops down alludes to my work done in the early 1990’s, and can also be the muse, or the higher or future self. I had made another sketch from Picasso of the hand maiden handing the Infanta a jug on a tray, and in my drawing these become free floating – caught in the moment. 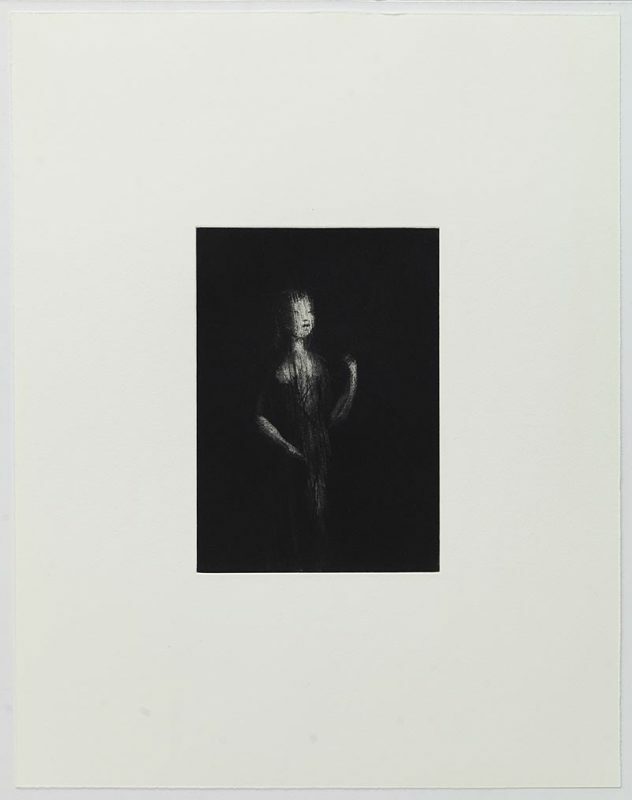 Aware of Being Aware began as a drypoint as part of the same series in 2014. 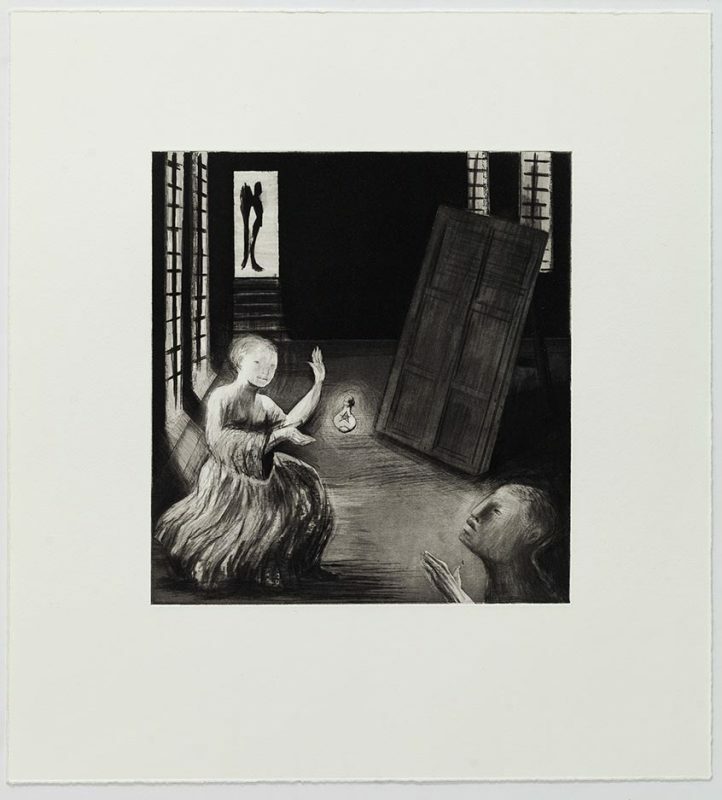 The plate was revisited this year by adding an aquatint, which created a solid tone covering the initial dry point. 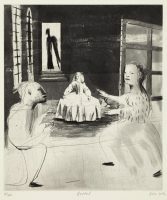 To transform the earlier image, Bell had to reintroduce the figure through a process of scraping and burnishing into the aquatint base. Read more about the collaboration with Phil Sanders and David Krut Workshop here and here.